2018-2019 Update: New lodge at Carinthia, it’s actually taking some pressure off the main base and even Sundance. Lifts and snowmaking and other improvements over the years have paid off; the luster is back and Mount Snow is once again “teh haps.” Weekends, especially holidays, just get busier and busier. It’s crowded, but as always you can find a quiet line if you know the hill. SkiBum.net has a new direct link to Mount Snow’s online discount lift ticket page. 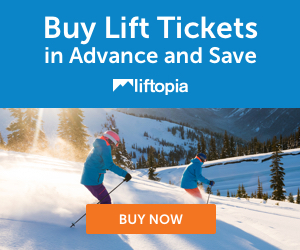 This is powered by Liftopia, and if you use it, a tiny percentage helps fund this website at no added cost. 2013-2104 Update: Meet the new boss, same as the old boss…Sneaux opened this season with a great trail count and a lot of Carinthia terrain. A couple of early snows and thaws saw the trailcount see-saw a bit, but in every case the snowguns have ramped up and fill in the blanks. The re-routing a few years ago of inbound vehicles seems to be working quite nicely for main base traffic. Mount Snow is one of the few big eastern resorts where you can still park close to the lifts. The bag check at the main lodge is well staffed and really a nice perk. Ticket windows are also well staffed this season. These may seem like minor points, but the fact is time is money, your time is valuable, and far better to spend it on the slopes than to be riding a shuttle bus or waiting in some endless line. I’m not saying they don’t have glitches here and there, just saying they do a really decent job with the detail stuff. Glad to see that the older lifts are running on weekends, which provides a nice alternative to the lines at the Bluebird. It’s also important on those occasional days when it’s foggy or windy at the summit — far better to ski 2/3 of the mountain off Canyon, Ego Alley or Sundance than to deal with nightmarish conditions at the summit. It’s not needed very often, but when it is, you’re much better off below the top ridge. 2012-2013 Update: Coming off a tough season, tough even for Peak Resorts’ crackerjack team. With the recently completed Bluebird Express and snowmaking improvements underway, it was a bad year for Mother Nature to say “feh.” But that’s what she did. Business was down and the older lifts stayed mostly quiet, even on holidays. Natural trails often had very sketchy conditions for the brief periods they were open. Employees weren’t smiling as much as usual; there seemed to be a general sense that this was a tough season. Those are the negatives…the list of positives? Well all you really need to know is that even in this horrible season, the list of positives was a lot longer than the list of negatives. A lot of trails were open even after drenching rains, and conditions were usually decent. The park rats had no complaints whatsoever; the terrain on Carinthia was in remarkably good shape for most of the season. The Bluebird Express made lines a lot more reasonable. All in all the old girl held up quite nicely during a darn difficult year. Assuming we have a real winter ahead of us, the crowds will be back. Let’s hope management spins the old lifts a little more often. January 2009 Update — Feel the Love! New ownership has put Mount Snow firmly back on top. Crowds during the Christmas/New Years week were unbelievable, but the trails held up well and short lines could be found on Ego Alley, Sunbrook, and North Face. Summit liftlines and parking lot snarls recalled the heyday of the 1970s. In other words, the fan guns and the early season snowmaking have paid off, and Mount Snow appears to once again be a major force in the northeast ski scene. It’s a happening, hopping place. 2008-2009 Update: Carinthia is getting yet another re-positioning in the marketplace, going back to the park’n’pipe theme but this time going all-out with an edgy, youth-oriented vibe for the entire section…even the lodge is getting re-vamped for this. Overall it’s probably a good move both from a marketing perspective and for giving the younger crowd their own space…Another BIG change this year, management has eliminated “Upper” from the Carinthia trails, which reduces the trail count, and, snow reports won’t be giving trail count but rather “open acreage.” It may help calculate how much terrain is available, and the reported numbers will not include tree terrain….They’ve also borrowed a page from our description style below — but even more so — Sneaux will have formal trail designations: Premium, Classic, and Natural. Premium are the Standards and Long Johns, virtually always groomed. Classic are the Ego Alleys and Fallen Timbers, generally groomed but not always. Natural are the trails like Big Dipper and Olympic, natural snow only and seldom (if ever) groomed. Our only comment on this is that they probably could’ve simplified it as Type I, Type II, etc. as some folks might confuse those definitions, i.e. Big Dipper is a Natural, but it’s only open with Premium conditions, and of course it’s a Classic trail. But let’s not make too much of this, after all it’s just a marketing thing. Hopefully the ratio of groomed:ungroomed will be unaffected, as most Mount Snow customers prefer the piste. We’ve updated the Carinthia trail names in our grid at the bottom of this site. 2007-2008 Update: With the purchase by Peak Resorts, a few things have changed that you should know about before you go. The traffic pattern has changed; entry to the main lots is one-way now, and the approach is from the old “north” entry off Route 100. Note that the locker area in the clocktower building is now limited to renters only…we haven’t yet found the benches and lockers…free bag check in the main lodge…improvements all around. Snowmaking has gone bonkers; Mount Snow has opened more terrain faster than any major resort in New England this season. In the western hemisphere, for that matter. On mountain changes and new trail names/terrain parks described below. It doesn’t have Killington’s reputation, nor Okemo’s pristine conditions. It doesn’t have Bromley’s charm, nor Stratton’s cachet. These are but minor issues to Mount Snow fans, who point instead to variety, accessibility, and above all, service. Built in 1954, Mount Snow has always been “the closest with the mostest” to the New York City ski market, regardless of what Hunter and Mountain Creek might claim. It’s far enough to be off the radar for the daytrippers, and small enough that the “serious” skier passes by for Killington or beyond. It’s become a haven for the above-average skier looking for a challenge. It’s for skiers willing to drive an extra hour or two to reach a mountain that “feels” big, without the mobs that swarm the Catskills. Main summit chair circa 1957. For more old-timey photos and memorabilia, please click here for our vintage Mount Snow page. A few of Vermont’s mountains look like God built them with skiing in mind. Stratton, Burke and Jay are like this, but Mount Snow is first in this class. Ski trails simply flow naturally at Mount Snow. Virtually every trail looks like it was supposed to be there. No dynamite, no weird traverses, no need for buses, trains or herculean efforts to get back to any particular base area. The Main Face works for beginners through intermediates, the North Face is reserved for experts, and Sunbrook is for those looking for a quieter cruise. Although the terrain is great, there isn’t quite as much of it as most people think there is. Mount Snow’s trail map (and everything else for that matter) boasts a 1700′ vertical on a 1900′ base elevation with a 3600′ summit. But if you want to ski from 3600′ you’d better have a parachute, since the actual summit is 3551′ and the lowest point you can ski to is 1909′. Not sure whether this is due to errant topo maps or Walter Schoenknecht’s penchant for bombast; either way it’s still a great ski area at 1642′ vertical. Beginners have plenty of places to go, from Ski Baba to the Launch Pad, but there is one spot that absolutely rules as soon as the beginner is capable of riding a chairlift: Cooper’s Junction. Use the short “Seasons” chair (#16). Liftlines are short, even during holidays. Cooper’s is a big field, a roller coaster of sorts, with just enough length and pitch to make it infinitely more exciting than the Launch Pad. Because higher level skiers can’t access a summit lift if they enter Cooper’s, they avoid it, so the beginner can enjoy it without being terrorized. And after a few hours on the #16 lift, the beginner can move to the adjacent #8 “Tumbleweed” lift for that “going up the mountain” feeling, and a brief venture onto Deer Run [maybe they call this section of Deer Run “Long John” now]. The Novice skier has an obvious choice: Long John — formerly Deer Run. This is arguably the ultimate novice cruising road in the east. Unlike the turnpikes at Killington and Okemo, there are really no dangerous intersections with higher rated trails. Some skiers prefer Long John, but Deer Run has more challenge for the average novice, and will move the skier along faster. It’s also a more interesting run. Note that the summit section of Deer Run is now officially called “Little John,” and still other sections have been renamed for a re-routed Long John. Sacrilege! Intermediates in the know work the 4.5 minute ride on the Canyon Express (#9) for Standard (now called Canyon) and Snowdance, instead of bothering with the more windblown conditions on the summit. If the line for Canyon Express is more than 5 minutes, they move to the 10 minute ride on the Sundance Chair (#7) to make use of Hop, Ridge, Shootout, and Sundance. But when the Sunbrook area is open, the smart intermediate moves immediately to that section. Advanced Skiers will be hard pressed to find a more enjoyable trail than Fallen Timbers on the North Face. The view is simply spectacular. It’s the easiest in that section, but with enough of a pitch to keep true intermediates at bay. Experts find a real test on Ripcord, regardless of how skilled they are. This is a short but extremely steep bump run that rivals anything in the country, however brief it may be. The real “hotshot” type skier may prefer the audience and piped in music on Beartrap, but that trail doesn’t come close in terms of all-around difficulty. Ripcord is the one that separates the true experts from the advanced hacks. Four of the lifts on the Main Face are surface lifts. These include the Voyager and Apollo “carpets” and Gemini rope tow, all in the Launch Pad area between the clock tower and the ski school. Each is a minute or less in ride time. The fourth is the Covered Bridge carpet, which brings people from the lower parking areas up to the Main Base Lodge. The Covered Bridge also services a tubing area. The shortest, easiest chairlift is also located at the Launch Pad. This is the #28 Discovery Shuttle, in keeping with the rocketry theme. It’s a fixed-grip triple that moves v-e-r-y s-l-o-w-l-y, yet is barely a sixty second ride. For beginners, it’s an excellent transition from surface lifts to chairs. Seasons chair shown in red, Tumbleweed chair in blue, Cooper’s Junction is the wide open trail between. Two other lower mountain chairs are the aforementioned #16 Seasons double and the longer #8 Tumbleweed triple. Both are fixed-grip chairs that rumble along at a quicker pace that the Discovery triple, but nothing too taxing. These chairs are purely for the novice. The 3 minute Seasons services Cooper’s Junction only, a pleasant novice pasture described in detail above. The 5 minute ride on Tumbleweed basically adds a quick loop using the ends of Somerset Road and Deer Run [Long John? ], which dump into Cooper’s Junction. The transition from the end of Deer Run/Long John to Cooper’s can be a bit daunting for the pure novice. It is the steepest part of the route, and frequently icy, but it will give them a much needed challenge. An alternative at the end of Deer Run/Long John is to turn skier’s right onto Seasons Pass. This novice trail wraps around the Seasons Condominiums, cuts through a tunnel, and returns to the base of Coopers. Sounds great, but the upper part is rather narrow, and the last third is a traverse. Shortly after the start of Seasons Pass, skiers can turn left onto Sweet 16, another novice trail served from the Tumbleweed lift. This route can be hard for the novice to find, and they frequently wind up on Seasons Pass or running out to the Carinthia Base. Some more difficult terrain — however brief — can be found off the Tumbleweed trail. These include Short Fuse, a super-short chute next to Frontier, which is a short but interesting tree skiing section to skier’s right off the chair. Another listed “trail” in this area is Gunsmoke, which is really just a merger of Short Fuse and Frontier. None of these are anything that anyone will really want to seek out. The only other Main Face trail accessed from Tumbleweed is the short Beaver Hill, which is a pleasant trail but requires some traversing to return to the lift (or any other lift). Moving up to the big lifts on the Main Face, at left as you face the mountain, #7 Sundance is an older, fixed-grip triple that begins at the end of the trail with the same name. It’s about 1,000 yards up the mountain. Because you have to ride another chair to reach it, Sundance is seldom crowded, and the runs it services are generally empty as well. The downside is the 10 minute ride, and it doesn’t even reach the summit. That’s not necessarily bad, since it’s only about 1000 yards from the summit, yet low enough that it avoids the wind and ice of the uppermost trails. The Sundance chair serves a number of intermediate favorites, although these trails are lower in the pecking order of snowmaking priority. You can use it to jump on Deer Run/Long John, or use the moderately pleasant High Traverse to move elsewhere on the mountain. Interestingly enough, the Sundance area was the last large addition to the Main Face at Mount Snow, added in 1960. Sundance chair shown in red. Sundance trail in yellow, Meadow in blue, Ridge in green, Hop in purple, High Traverse to South Bowl shown in black. The upper section of the Sundance liftline is the Shootout trail. The primary trails served by the Sundance chair are Shootout and Sundance, which run under the liftline. Both are typical Mount Snow blue squares. Sundance is bisected by the seldom-used Low Traverse, an annoying novice cross-mountain trail, as well as Somerset Road, ditto. Drop is a short intermediate trail that branches off skier’s left from the Sundance trail, and leads to the center of the Main Face. A short cross mountain novice chute, Bailout is required to bring the skier back to the Sundance lift. Another route from this chair is Hop to Meadow (since re-named). The latter is a wide, gentle, delightful intermediate trail; even good novices can easily deal with Meadow. The thing to note is that while Sundance and Meadow are frequently groomed, the two trails that serve them — Shootout and Hop — are manicured less frequently. Neither has snowmaking coverage, so they are often left natural to preserve the cover. The more commonly used option is to take Ridge after a short stint on Deer Run/Little John. Ridge ends at Meadow after a nice rolling run that most intermediates love. Ridge also has the advantage of being one of the few trails with snowmaking in this particular grouping. Further down Deer Run/Little John, Sundance chair skiers can jump onto Uncle’s, another trail without snowmaking. Uncle’s is one of the true throwback trails at Mount Snow; a narrow, ungroomed New England classic that feels like a little bit of 1958. Uncle’s requires a brief runout on the Low Traverse, but it isn’t too long before you dump into Meadow. For Sundance area skiers who don’t want to bother with Deer Run, or when Hop and Shootout are closed, a quick zip down High Traverse leads to the lower 2/3 of South Bowl, a moderate blue that uses Link to reach Ridge. Other than Ridge, this is arguably the most-used route on this part of the mountain, as it has snowmaking and frequent grooming for its entire length. Downside to the Sundance Area is that the chair seldom runs, and when it does, it’s one of the first to be shut down. Without the convenience of the Sundance chair, you have to work your way back to the summit chairs via the annoying Beaver trail complex. If you do see Sundance running, it means the base is fabulously crowded. Jump on Sundance and use it as long as they run it. Now we go to the opposite side of the Main Face; #9 Canyon Express is the furthest Main Face lift from Sundance. The reason being that Canyon Express is sort of a modern version of Sundance, and infinitely more crowded. Where Sundance offers the old fixed-grip triple, Canyon’s detachable quad whisks skiers 3/4 of the way to the summit in less than 5 minutes. Yet the two areas have their similarities; one of the most popular runs off the Canyon chair is the very Sundance-like Snowdance. This is one of Mount Snow’s widest runs. When conditions are “on,” it’s one of the finest intermediate runs in the country. Snowdance is a series of dips and undulations that even an emerging intermediate can navigate. It’s simply a pleasurable run that ends in Grand Central, which is a blue-rated runout trail that probably should be a green. It’s decent, as runout trails go. Be aware that the right-hand side of Snowdance (skier’s right) is often ungroomed. It doesn’t get a lot of traffic, so it doesn’t bump up…but it does glaze over, and frequently. For the unsuspecting intermediate, this is a death trap. Canyon Express chair shown in red. Canyon (formerly Standard) in yellow, upper portion of Snowdance shown in blue, Overbrook in green, Roller Coaster shown in black. Other great blues off the Canyon chair are (Lower) Canyon, which is really a busy staging area for the lower Canyon trail and Canyon’s signature trail, Standard. Standard splits off of Upper Canyon at Link. Few skiers off the Canyon Express actually do the entire length of Standard; they generally work over from Canyon and sometimes feed onto the end of Choke. Choke is similar to the top part of Standard; the trails actually cross and most skiers wind up “switching” trails — assuming they are staying on the same trail. The main difference is in the grooming; generally one or the other is tamed. Either way, they all end up at Standard, which is possibly the best-known intermediate trail at Mount Snow, since it is usually the first to receive snowmaking in mid November. It’s a terrific trail, but when conditions are lean and few trails are open, Standard can become routine. But no matter where you’re skiing, Standard (or at least the end of it) should be your “way home” at the end of the day. It has a nice final drop to the clocktower, and it’s always best to end front and center at Mount Snow. Two roads less travelled in the Canyon Express section are Overbrook and Illusion. Illusion is a narrow route off the terrain park, and is visible just to the right as you ride the chair. Like everything else in the neighborhood, it wears a blue square. Overbrook is sort of the “anti-snowdance” trail. It’s narrow by comparison, has more turns, and receives less grooming. It’s a good test for emerging intermediates looking to better their game. Both end at the aforementioned Grand Central runout trail. The last regular trail to mention in the Canyon Express area is One More Time. This is kind of a “Deer Run for intermediates.” It winds down and around into Grand Central, and is the longest run off the Canyon Express if you don’t include the ghastly Somerset Road traverse. Somerset is a way to move across the Main Face from Canyon Express, but honestly, you’re better off skiing down a regular trail and traversing at the base. It bisects about a dozen trails; there’s nothing worse than roaring down Overbrook and having a mother hen with a couple of rugrat snowplowers creep across the trail. In addition to Canyon’s sole green trail, One More Time is also the route to follow to this section’s only black diamond territory. The Boonies is another tree skiing section. Those fond of tight glades should note the Boonies on the trail map; it is often open when Mount Snow’s other tree areas aren’t. On some of our maps and such you’ll see a terrain park called “Un Blanco Gulch,” which was reverted back to the lower Canyon trail, and then re-named Roller Coaster, which is what they call it now. Un Blanco was the first “big” terrain park in the east, although it pales in comparison to what’s come along since. When the terrain park stuff was relocated to Carinthia, this trail became sort of a featureless park. It has some ledges and double fall line hills, it often gets seeded with bumps for a section, and it has some blind rollers. All in all a fun trail. The #12 Ego Alley chair is similar in scope to the Sundance chair, it’s a fixed-grip triple that terminates 2000 yards or so short of the summit. It’s newer and faster than Sundance, and since it starts at the base and rises a little higher, it sees more traffic. But it’s still a 9 minute ride, so a lot of skiers opt for the neighboring summit chairs. Ego Alley chair shown in red, Ego Alley trail in yellow. The main route off this lift is an intermediate run on the main face called — surprise — Ego Alley. It’s a fun trail, generally groomed, with perhaps more pitch than some of the blue squares at Mount Snow. It will inflate the ego of intermediates who rip down it, so it’s aptly named. On weekends this trail is sometimes used for racing, but skiers can easily move to Exhibition and Lodge without too much trouble. Another popular route off the Ego Alley chair is the aforementioned Link to Meadow or Sundance trails in the Sundance section. Skiers who use Sundance and Drop can enjoy two short but sweet Ego Alley runs, Yard Sale, a very brief and not too tough black diamond, and Beaver Tail, a novice trail that receives a lot of traffic. The only truly challenging terrain in the Ego Alley section is Sap Tapper, yet another of Mount Snow’s very tight tree skiing areas. Like the others, it’s seldom open. When the summit lifts get crowded, or the summit is windy, the Ego Alley chair is the worst-kept secret on the mountain, because its non-existent line is in plain view of the Grand Summit Express. Despite the fact that it is out in plain view, few people use it. I don’t get it. I’ve been at Mount Snow on windy, icy days when the summit runs were horrifying, yet people positively ignore the Ego Alley chair. If you see it open, and the Summit and Canyon lines are long, use Ego Alley. Summit view from the early 1970s. Although the “back” of the summit is more developed today, it appears much the same. Two chairs run from the base area to the summit. The preferred route is the lightning-quick Bluebird Express, a weird looking six-pack with a bubble top. The old #11 Grand Summit Express, a detachable quad that does the job in about 7 1/2 minutes is used mostly on busy days. The key (when both are running) is to judge the line at the Six Pack, and plan accordingly. Be aware that the line for the Six moves faster than you might think. Neither has any significant advantage in where you are deposited on the summit. The primary attraction to landing on the summit versus the lower terminating lifts is that you have access to every trail on the Main and North Faces, almost every trail on Sunbrook, and a few of the trails on Carinthia. The other attraction is the longer vertical; but again, if you are working the Main Face, you are often better off staying with the Ego Alley, Sundance, and Canyon lifts. Starting at the summit adds about 2,000′ length to the runs above Canyon, about the same for Ego, and only about 1000 yards to the runs above Sundance. Grand Summit Express shown in red, Summit Local shown in green. The approximate routes of Deer Run/Little John and neighboring Long John are shown in yellow. The traverses are as follows: High Traverse in blue, Link in purple, Low Traverse in white, Somerset Road in orange. Exhibition runs the liftline of the Grand Summit Express. Lodge, then Sapbucket, run the liftline of the Summit Local. The Ledge trail is directly to the right of the Lodge Trail/Summit Local. For a lot of skiers, however, the trip to the summit is all about two key trails at Mount Snow: Deer Run (part of which is now “Little John”) and Long John. As mentioned above, these are two of the most beloved “novice turnpikes” in all of New England, and perhaps the entire country. Deer Run has one alternate route, a short intermediate trail called Cut Off. Cut Off is aptly named, as it clips off a corner that frequently bottlenecks. It’s seldom groomed, but doesn’t usually bump up too much. It gets very little traffic as it is totally dependent on skiers from Deer Run, and looks deceptively steep to the average Deer Runner. The remainder of the trails off the summit are all upper portions of Main Face trails. South Bowl is perhaps the most popular of the non-Deer Run/Long John routes, and is described in the Sundance section above. The rest are Upper Exhibition, Upper Lodge, Upper Ledge, Upper Choke and Upper Canyon. Each has varying pitch, is prone to ice, and begin with a relatively narrow chute before dropping off the summit. Upper Exhibition has portions where the trail is canted, and thus is perhaps the least pleasant of the summit runs. Upper Choke & Upper Ledge are last on the grooming list. Upper Lodge and Upper Canyon are perhaps the easiest routes, and can generally be negotiated by a very strong novice. The only other pure summit run on the Main Face is Tramline, which presents a short alternative to the end of Upper Exhibition. It doesn’t have snowmaking, and is groomed less frequently. Another run, Committed, is listed in the snow reports as a Main Face trail, but is primarily used to flirt with the North Face, as is Skyline. This leaves three important runs that are generally accessed by summit chair skiers, all of which have “upper” trails: Exhibition, Lodge and Ledge. Along with Ego Alley, these make up the “Front Four” at Mount Snow — sort of a junior league version of the vastly more challenging front four at Stowe. All have snowmaking. Exhibition and Lodge are groomed, Ledge is less frequently. Exhibition runs the length of Grand Summit Express liftline. It has some unusual pitches, and slopes to skier’s right higher up. Lodge is the most pleasant cruise, and Ledge is more in the narrow/classic New England style. A couple more trails branch off Lodge and Exhibition lower on the mountain. Pat’s Pitch is a short wall — sort of like Yard Sale — under the Summit Local. Sapbucket is a nice blue under the bottom of the Summit Local, and is sometimes used for race events. Charlie’s Chase is a trail that runs adjacent to Sapbucket, and catches some traffic from Lodge and Standard. Some Main Face facts and tidbits, in no particular order: Switchback is a short traverse off Deer Run that drops skiers into the bottom of Meadow. Currently there are 12 lifts of some form or another on the Main Face. Interestingly enough, this number has not changed since the late 1970s, but the uphill capacity is probably double, thanks to the greater efficiency of the two express lifts. Sunbrook quad chair shown in red, Beartrap double shown in green. Trails, from left to right: Big Dipper shown in yellow. Little Dipper in dark blue. Moonwalk in orange. One Small Step in dark green. Moonbeam in red. Cloud Nine runs the upper 2/3 liftline of the Sunbrook quad. Thanks Walt in black. Sunspot in olive. Shooting Star in pink. Beartrap under Beartrap double chair. Milky Way shown in light blue, lower right of image. Sunbrook time, and the living is easy. Opened in 1970 as the Sunny Side Sunbrook area, this section is a sentimental favorite for Mount Snow families and skiers who like a quieter experience. It’s also a good step up for emerging intermediates who’ve mastered the Deer Run/Long John stuff. The #19 Sunbrook chair is a fixed grip quad that trundles along at a leisurely pace, taking a full 10 minutes to run the valley back to the summit. However sluggish, it’s arguably the most pleasant chair ride at Mount Snow. For many years, no such lift existed in Sunbrook; skiers had to ride the #14 Beartrap double chair, ski down Long John to the Main Base, then ride one of the summit chairs to re-enter Sunbrook. Management revived this for weekday operations a few years ago, so study the morning trail report carefully. If Big or Little Dipper are open and the Sunbrook chair isn’t, it’s well worth your time to look into this section because the trails will be very quiet. Today’s Beartrap is a quick 2-minute ride, and generally used only by skiers accessing the Beartrap run, or when the line on the Sunbrook chair gets too long and skiers elect to move elsewhere. The Beartrap run is sort of an oddball; it’s a fairly steep show-off mogul stage for hotshots, complete with piped in music, plenty of teenagers, and a continuous audience on the lift above. It’s well removed from the rest of Sunbrook, so it doesn’t interfere with the other trails, and the kids & families tend to avoid it. The true Sunbrook is kind of a mini-ski area, much different from the two trail expansion of the 1970s. The backbone of Sunbrook is still Big Dipper. Originally called “Moonwalk”, Big Dipper is a pleasurable cruise with one “dip” or drop that gives some intermediates pause. Other than that, it does get icy at the the final turn above the base of the chair, so it is often smart to turn skier’s left onto Moon Beam, a short trail that funnels into the fairly wide open base area. The other original run was known as “Coldbrook,” which no longer exists in complete form. The upper portion is known today as Little Dipper, which cautious intermediates will find much easier than Big Dipper. Little Dipper funnels into Big Dipper at about the point where Big flattens out. The original route of Coldbrook is lost at this point, although interested skiers can jump on One Small Step, a very short trail that reconnects with the original route at the lower portion of Thanks Walt. Thanks Walt is the quickest way from the Main Summit into the Sunbrook area. It’s got snowmaking, is frequently groomed, and it’s really a pleasurable cruise. It’s named in honor of Walter Schoenknecht, the original developer of Mount Snow. For more on Schoenknecht, who unsuccessfully petitioned the US Atomic Energy Commission to detonate a nuclear bomb to create a deep snow bowl at Mount Snow, see below. Sunspot is a short run from another part of the summit, near the beginning of Long John, that dumps into Thanks Walt. Further down Long John is a winding route called Shooting Star that falls into Thanks Walt under the Sunbrook chair at mid-valley. Another summit route into Sunbrook is a rather easy trail known as Moonwalk, which terminates at Little Dipper. Three routes run from the top of the Sunbrook Chair. The first two are the aforementioned Dippers, the third is Cloud Nine. Cloud Nine is a terrific run under the liftline that presents very little challenge until after it bisects Thanks Walt. It’s moderately steep as intermediates go, and the emerging blue will gladly echo “thanks” if he or she chooses Walt’s namesake trail as an alternate. Cloud Nine ultimately joins Shooting Star, or vice versa. Last but not least are Milky Way, an under-used intermediate run from the summit of Carinthia that winds down to the Sunbrook base. And finally Darkside of the Moon is a loosely defined tree skiing area between the upper trails. Treeskiers also cut routes through virtually every other section of Sunbrook when snowfalls are plentiful; the fairly gentle terrain and remote feeling of the valley seem to be a magnet for this type of skiing. Most of the trails in Sunbrook, such as the Dippers, don’t yet have snowmaking, and are seldom groomed. Please note that this map needs to be updated. Nitro Express quad chair shown in red, Heavy Metal double shown in green. Trails, from left to right: Titanium shown in yellow. Nitro runs the liftline of the Nitro Express chair – shown on this map as Upper & Lower Nitro. Tunnel Vision shown in orange. Nugget shown in light blue off the Carinthia summit. Mine Shaft shown in blue. Prospector shown in magenta. Upper and Lower Iron Run shown in olive. Inferno shown in double black has reverted to Stugger’s Chute and is now an intermediate run Narrow Gage runs the liftline of the Heavy Metal chair. El Diablo shown in black became The Vermonster, now renamed The Gulch. Rusty Nail is a medium-feature, natural park. Location of Ski Baba/The Grommet, not shown, is below the Heavy Metal chair. Carinthia is one of the quirks at Mount Snow. This was a full-fledged modest ski area in its own right, that went out of business and was acquired by Mount Snow in 1986. It is still sort of feeling its way; it’s a bit removed from the Main Face traffic, yet it tries to be all things to all people…Baba for the beginner, Parks for the boarders, Titanium for the masses. For years it was largely underutilized, during recent times has become a mecca for freeskiing/park/halfpipe etc. With the oversized features, and the incredible length of the feature-laden trails, Carinthia was the area that enabled Mount Snow to be ranked “#1 in the east for parks and pipes” year after year. Then in 2006-2007 Carinthia received a makeover. Inferno and El Diablo reverted to earlier names. The hits and jibs were moved to Nitro. Nitro spent a year with a “name this park” title. (The whole “name this trail” thing is a tradition at Mount Snow that dates back to the 1960s.) Anyway, cut to the chase here, it seemed that ASC wanted to position the Nitro Express chair for the shredders, while the Heavy Metal double became a pleasant, almost “old-fashioned” New England section of the hill. Well that all changed when Peak Resorts purchased Sneaux from the slow strangulation of American Skiing Co. Nitro went back to Nitro, and the hits and jibs went back to the Heavy Metal Chair. As of 2008-09, the whole shebang is now a giant terrain park. And as of March 2012, I can tell you this section of Mount Snow had settled into its terrain park role quite nicely. By 2019 with new lodge and new luster, Carinthia has become a vital base area at Mount Snow. Mine Shaft starts right off with a mini-pipe, front and center at the base is the big superpipe. Trails are either designated as small/medium/large features, or as “natural” trails that will get hits and features as snow permits. Like every other section of Mount Snow, Carinthia has a couple of surprises. One is Claim Jumper, a tree skiing area that often has terrific conditions. Up until a few years ago the real under-used gem at Carinthia was Ski Baba, an outstanding novice trail alongside the #1 Ski Baba chair, a fixed-grip double that chugs up the slope in about 2 minutes. Unfortunately it received little use and was seldom open; it had been converted to a tubing hill, then a learning park. Finally they removed the chair, put in one of those carpet things, and it’s a totally safe haven for little kids. Notice the “mining” theme to the trail names? This is based on the fact that a Revolutionary War-era iron mine was said to be located on Carinthia. Summary of Carinthia: Because it is one of the premier terrain parks on the planet, it gets crowded. Trails are crowded, the lodge is crowded, and the line for the detachable chair is crowded. As the majority of these customers are youths, you might expect the place to be dripping with attitude. Well it has some, to be sure, but to quote The Who, “the kids are alright.” Behavior is generally good; better than you’d expect. Anyway the key thing here is the features. I don’t ski features, or hits, or jibs…nor do I fly over the kickers. But some of these kids do, and some of them do very amazing things. If you can make the time to do it, ski alongside a trail with large features (they have narrow alleys on the side for us gapers) and watch what goes on. I guarantee you will be impressed. Challenger triple chair shown in red, Northface triple shown in green. Trails, from right to left: Olympic is shown in black, Fallen Timbers in yellow. Chute is approximately where the Northface chair is shown. Challenger is shown in blue. Freefall runs under the Challenger chair. PDF is shown in purple, Plummet in dark green, Jaws in maroon. Ripcord is in orange, Second Thoughts is the “escape” from Ripcord shown in olive. The dashed red line at the top is Committed, and the light blue below Ripcord is River Run. Each of the vertical descents are classified as advanced, except for Ripcord, which is rated double black for experts only. The #10 Outpost chair and #18 Challenger chair are both fixed-grip triples. Because they originate in what is essentially an advanced skiers-only area, the chairs run at a fairly decent speed. The Outpost triple makes the ascent in 8 minutes, while the Challenger clocks in at 7. When both are running, pick which ever has the shorter line. Early and late season, and off-peak days, the Challenger runs while the Outpost sits idle. The marquee trail on the North Face is obviously Ripcord. This short headwall rivals Outer Limits or Vertigo at Killington, but is less taxing because it is much shorter. But if you ask any intermediate who ventures down Ripcord, they will tell you it is a very long, torturous route. Without the bumps, Ripcord would be just another extremely steep headwall. But it bumps up quickly, and becomes virtually unskiable for the average black diamond enthusiast. Second Thoughts is sort of a safety valve for intermediates and emerging diamond skiers who have more testosterone than brains, and find themselves in way over their heads. There’s really no other purpose for this trail. Olympic and perhaps Challenger have the easiest grade; Olympic was rated a blue square back in the 1970s. Both receive less frequent grooming than some of us would like, so they certainly warrant black diamond status. Chute, Freefall and Fallen Timbers get frequent grooming, particularly Fallen Timbers. Fallen Timbers generally has the best snow conditions, and with terrain that offers periods of respite, is probably the easiest route in this section. It’s also got a terrific view and is truly a pleasure to ski. When conditions are good, it’s a great step for high-end intermediates. Chute is probably second, but for some reason, is usually more icy than Fallen Timbers. North Face has some tree skiing, with varied levels of difficulty. The Plunge is a double-diamond drop adjacent to Ripcord, seldom open. Epiphany is a strip of trees between PDF and Freefall, and although a single diamond, has some very tough routes. The Trials is a wider area off to skier’s left of Olympic, and is a favorite for telemarkers and traditional tree skiers; often has patches of snow late into April. Other trails considered part of North Face are as follows: Skyline is a summit area traverse; it leads to and from the Main Face, North Face, and Sunbrook. It’s rated a blue square simply because it leads only to blue square or higher, and thus discourages novices from following it to their doom. Committed is technically on the Main Face, but since its main purpose is to lead skiers to Jaws and Ripcord, many think of it as part of the North Face mix. Grooming is hit or miss on this trail. Last but not least is River Run, the one trail on the North Face rated for intermediates. It isn’t really North Face skiing; it’s just a run out for some of the steeps, and serves as a kind of “back door” entry to the North Face for Canyon Express skiers. Although “Jaws of Death” opened in 1958, the North Face didn’t receive a dedicated lift until 1963. Skiers were required to return to the Main Face. If you’re finding this helpful, and you’re in the market for Mount Snow tix, click and bookmark this page: Mount Snow’s online discount lift ticket page. The site is powered by Liftopia, and if you use it, a tiny percentage helps fund skibum.net at no added cost. Au Natural Carinthia see Rusty Nail, below. Bailout Main Face Where Drop becomes Yard Sale, this trail offers escape along the snowcat road below the pond at the bottom of Sundance. Has been on the map for decades, although the name didn’t appear until more recently. A short traverse, seldom groomed but doesn’t need to be. Bear’s Crossing Sunbrook Not shown on trailmaps; believed to be the short, narrow, sometimes icy drop that connects the top of the Beartrap chair with Long John and the Main Face. Because it is so narrow and used by so many people, it frequently becomes a scraped-up mess by late morning. Beartrap Sunbrook Showtime mogul route under the Beartrap chair, piped in music, continuous audience, great stage for skiers who can “run the zipper.” It’s no Ripcord, but it’s tough. Never groomed. Beaver Hill Main Face Actually two trails that merge into one, generally referred to as “Beaver” by official Mount Snow people. Short Y-shaped route connects Sundance/Tumbleweed/Deer Run traffic to the main base area…and vice-versa. This is really just a mad, jumbled, intersection of skiers. Collision country. Once a much longer slope, served by its own chair, extended down the hillside now occupied by Grand Summit Hotel. A mini terrain park, Grommet, is planned for the lower portion of the slope. Almost constantly groomed but it doesn’t much matter, trail mainly just funnels skiers to the base area. Beaver Tail Main Face Short Y-shaped route connects Yard Sale to base area behind Grand Summit Hotel; adjacent to Beaver Hill. Named as a separate trail sometime in the early 1980s. Like Beaver Hill, grooming on Tail is hit or miss, and again, it mainly just funnels skiers to the base area. Once a much longer slope, served by its own chair, extended down the hillside now occupied by Grand Summit Hotel. Big Dipper Sunbrook Built in 1970. Only complete top-to-bottom trail in Sunbrook. When groomed, easy for mid level novices to negotiate; has one notable dip. Also the only original Sunbrook trail in its entirety; called Moonwalk well into the 1980s. Natural snow only. May or may not be groomed; seems to get an occasional grooming. If it does receive snowmaking, that may change. Canyon Main Face Most popular route down the Main Face, usually the first run open in early season. Most of it is accessed off the Canyon Express chair; another of the signature groomed cruisers at Mount Snow. Rolling terrain, could be handled by a high-end novice. Old-timers still refer to it as Standard, although it is now officially on the trail map as “Canyon.” Standard, err, Canyon is usually always groomed. Upper section is a good summit route for getting to Snowdance, River Run, lower part of Canyon, etc. Tends not to be as icy or windblown as some of the other summit routes. Generally always groomed, can be negotiated by a low end intermediate, although sometimes it becomes a skating rink by mid afternoon. Caved In Carinthia Annoying traverse that runs from Titanium to Stugger’s Chute, bisecting the sterrain parks on Nitro and Iron Run. No longer shown on the 2008 Carinthia map. Originally called Detour on Mount Snow’s first Carinthia map after the 1986 purchase. Charlie’s Chase Main Face Racing trail with timing shacks on the bottom 1/3 of the mountain, entered off of Exhibition. For public racing, generally always groomed. Most of this trail is under the Summit Local lift. Until recently, this trail was the lower section of Lodge. Choke Main Face Older trail now combined with Upper Choke, runs from the Summit to partway down Canyon. Unchanged for decades, although the specific territory referred to as Choke used to include the very topmost portion of Standard (now Canyon). Not usually groomed. Chute North Face Runs the liftline of the North Face Outpost chair for most of its length, an original trail similar in style to Fallen Timbers, however it is groomed less frequently. When groomed it can be negotiated by high-end intermediates. Because of its rolling style and periodic pitches, there are some blind spots below; be advised to slow somewhat as you crest the various pitches to assure a clear route below. Cloud Nine Sunbrook Follows the upper liftline of the Sunbrook chair, terminates at Shooting Star. Easy trail for all but the lowest intermediates. Usually groomed. Looking down Cloud 9 under the Sunbrook lift at the intersection of Moonwalk. Committed North Face Short run from the summit that connects with Upper Canyon on the Main Face. Mostly used to connect skiers to Jaws or Ripcord. Original route connected with Upper Overbrook, which no longer exists. Not groomed. Cooper’s Junction Main Face Wide open field alongside the #16 Seasons lift. Once you enter Coopers, only the #16 or #8 lifts are available, so higher level skiers stay away. Good practice area. Formerly known as Lower Sundance, late 70s early 80s. Groomed regularly. Countdown Main Face Not clear where this is; believed to be one of the slopes that drops toward the Main Base Lodge. Not shown on trailmaps. Well, it’s usually listed as groomed and open, so wherever it is, we hope you enjoy it. Cut-off Main Face Considered part of the Sundance section; one of the three intermediate trails that drops off the upper flat portion of Deer Run. Cut-off is the only trail that leaves and re-enters Deer Run; it “cuts off” the crowded corner on the shoulder of the mountain. Has followed the same route for decades. Although not usually groomed, it is a good way for high-end novices to test their legs on a blue slope, as it returns quickly to Deer Run. Deer Run Main Face Now just an alternate route along Long John. At one time much of Long John/Little John were known as Deer Run. Drop Main Face Short trail of moderate difficulty that leads skiers off of Sundance to Ego Alley; frequently used to move away from Sundance to Summit chairs. Drop has followed same route for decades. Not often groomed, but usually quite tame. A pleasant twist through the woods. Ego Alley Main Face Older trail, 4700′ length that runs the liftline of the Ego Alley chair. Unchanged for decades, groomed regularly, an intermediate favorite. Sometimes closed for racing. When this trail isn’t groomed it can be quite challenging for intermediates. Exhibition Main Face Runs under the liftline of the Grand Summit Express. At one time called Upper Exhibition, Middle Exhibition and Lower Exhibition. Sometimes windblown and icy at the very top. Most of it can be negotiated by a strong novice, although the continuous audience might be intimidating. Upper section of the trail has unusual pitch and odd fall lines at certain points. Usually groomed. Fallen Timbers North Face Probably the easiest of the black diamonds on the North Face, a fun trail with varying pitches. Would be considered a high level intermediate trail if it were located at Killington. Usually groomed. Was known as 4RKDS for the 1993-1994 Season as the result of a “name a trail” charity auction. The Flats Carinthia Aptly named trail section connects Season Pass trail to Carinthia Base. Frequent poling and sometimes walking is required. Generally groomed; not shown on the parkified 2008-2009 Carinthia map. Fools Gold Carinthia Primary intermediate at Carinthia, originates off the Nitro Express chair, terminates at base area. Extreme looker’s left on Carinthia map. Now listed as a “Natural Snowfall Park” in that Mount Snow will build features as conditions permit. Trail originally called Upper Titanium and Titanium during the 1990s, was Upper and Lower Villager in 1986. Freefall North Face Newer North Face trail that runs under the Challenger lift, usually groomed. When groomed and conditions are decent, Freefall can be negotiated by high level intermediates. Grand Central Main Face Run-out trail starting at the end of Snowdance, collecting skiers from Overbrook, Un Blanco, Illusion, etc. Quite pleasant as funnel type trails are concerned. Although rated intermediate, is clearly a novice trail, except no novice terrain feeds it. Usually groomed. Grommet (current) Carinthia Formerly Ski Baba, this is a little novice hill adjacent to Deer Creek Condominiums, served by double chair of the same name. With the repositioning of Carinthia in 2008-2009, Ski Baba/Grommet is becoming a learning park. This slope was called Rope Tow when it was part of the original Carinthia ski area. Not to be confused with a previous “Grommet,” which was a beginner terrain park on the Beaver Slope in the mid-2000s. The Gulch Carinthia Large feature terrain park. Old line Carinthia trail called Fairway that was converted to a slopestyle terrain park called El Diablo. It reverted to Fairway for the 2006-2007 season.Trail was known as Carinthian Fairway prior to Mount Snow ownership, then re-named Upper and Lower Fairway after the sale, then converted to El Diablo slopestyle terrain park, then back to Fairway for 2006, and then Vermonster for 2007-2008. Got all that? Doesn’t matter; it’s been renamed The Gulch for 2008-2009. Gunsmoke Main Face Extremely short drop near the top of the #8 Tumbleweed chair, only recently added to trail maps. Hard to figure out exactly what Mount Snow is referring to; it may be that this is small cut segment of the old #7 liftline dating back to the 1970s. Whatever it is, it’s not usually groomed according to the daily reports. The Gut Carinthia Superpipe located at Carinthia base. Built in 1996; the 2006 version is shown in this photo. Usually an enormous pipe. High Traverse Main Face Traverse connects top of Sunbrook chair with top of Canyon Express. Good for moving from the gentler summit trails on the left side of the mountain (skier’s right) to Overbrook, Snowdance, Standard, etc. Can easily be negotiated by novices, but since it bisects numerous trails and only accesses intermediates, it’s a blue. Portion that connects Sunbrook chair to South Bowl used to be known as Powerline. The current traverse grew in bits and pieces through the years. Usually always groomed. Hop Main Face Runs from top of Sundance chair to Meadow. Older trail has followed similar route for decades. One of the more challenging blues; not usually groomed. Illusion Main Face Narrow trail between lower portion of Standard and Canyon. Accessed from the Canyon Express chair. Sees very little traffic. Trail originated sometime in the 1970s. Not generally groomed. Inferno Carinthia Extra Large park features. Old line Carinthia trail now an extremely advanced terrain park for psychotics. Trail was called Stugger’s Folly in the Carinthia Days, then re-named Stugger Chute after Mount Snow took over, then Inferno, then back to Stuggers Chute, then re-named Inferno with the 2008 parkification. Iron Run Carinthia Now listed as a “Natural Snowfall Park” in that Mount Snow will build features as conditions permit. Trail drops into Superpipe area. Moderately steep. An old Carinthia-era trail with no snowmaking. Only trail to keep the original Carinthia name, which is based on a Revolutionary War era iron mine located along the trail. Jack Knife Carinthia Briefest of crossover routes leads from Narrow Gage into Inferno. Seldom groomed, not even shown on new Carinthia map. Jaws North Face Dates back to 1958. Seldom groomed, second to Ripcord in steepness and reputation. Known as Jaws of Death until recently. Jaws follows a combination of trails known in the early 1980s as Plummet (not the same as today’s) and Jaws of Death. The upper part of the original Jaws of Death is now the top part of Plummet. Got that? Junkyard Carinthia Hikable terrain park with small and medium features. Trail was lower portion of Nitro prior to parkification of Carinthia. Launch Pad Main Base Refers to the large beginner/novice area served by the carpets, rope tow, and short chair. Although Launch Pad offers varying pitches and seemingly perfect terrain for the beginner, it is often crowded with haphazard skiers. Meticulously groomed. Originally called Learning Center. Ledge Main Face Runs from termination of Upper Ledge at Link, then wraps in and out of Standard before it officially ends just below Somerset Road. Originally known as Lower Ledges, now includes a short drop below Somerset Road that used to be called Bypass. Some skiers use Ledge as a means of access to cross from Standard and Lodge. Summit was once known as Upper Ledge, and before that it was Upper Ledges. An older, very narrow trail; a few mistake it for a closed section of Upper Lodge. Sometimes icy & windblown; although it has snowmaking it receives little attention and is often closed. Not usually groomed. Formerly a blue square, this “upper” section of the trail was redesignated as a diamond for the 2006-2007 season. Link Main Face Traverse connects top of Ego Alley chair to area just below top of Canyon Express. Used for going from Canyon Express area to Ego Alley, Meadow, Sundance, etc. Can easily be negotiated by novices, but since it bisects numerous trails, requires some uphill walking, and only accesses intermediates, it’s a blue. Not a trail people seek out to ski; just used to move between trails. It’s a line of demarcation between lower mountain and summit area. Has existed in its current format for decades. Usually always groomed. Little Dipper Sunbrook Runs from top of Sunbrook, ends at junction with Big Dipper where Big flattens out. When groomed, easy for mid level novices to negotiate. Follows the route of the upper portion of an original 1970 Sunbrook trail called Coldbrook. Generally groomed. Little John Main Face We’re in denial. See Deer Run, above. Lodge Main Face Runs from termination of Upper Lodge at Link, then sort of runs into Standard although it officially turns skier’s right into Charlie’s Chase. Originally known as Lower Lodge Run, now wider than it was in the 1970s and early 80s. A good trail for emerging intermediates. Usually groomed. Summit section once called Upper Lodge Run and then Upper Lodge, that runs the upper liftline of the Bluebird Express. Sometimes icy & windblown at the narrow top of the trail. Often groomed. Long John Main Face Longest route on Mount Snow, beloved novice trail. For 2009 a flat/uphill section has been removed from the map, and the Long John moniker has been assigned to parts of Deer Run. The summit section is a bit narrow; that and the surrounding pine trees give novice skiers the feeling that they are somewhere much, much different from the bunny hills they are used to. For this reason it is frequently an exhilirating experience for skiers making the jump to the top for the first time. Usually always groomed. Long John is one of the most beloved novice summit routes in the USA. Low Traverse Main Face Traverse connects Long John and Deer Run to Standard. Used for going from Long John, Deer Run, and the Sundance area to the Summit chairs. Not a trail people seek out to ski; just used to move between trails. Annoying traffic crossings result. In the early 1980s it was known as Back to Midstation. Usually always groomed. Milky Way Sunbrook Mildly interesting trail that runs from Carinthia summit to Sunbrook base. One corner with a pitch, but a high end novice can usually handle it. Generally always groomed; presents a view of the old Haystack ski area at the top part of the run. Mine Shaft Carinthia Starts with a mini pipe, then goes to medium and large features. Wide, pleasant, moderate run off the Nitro Express chair, has a long flat run-out at the end. Trail was called Sprung’s Sprint after Mount Snow took over in 1986. Moonbeam Sunbrook Short easy trail that connects Big Dipper to Thanks Walt. Good for cutting off the final turn and drop on Big Dipper, which is frequently icy. Generally groomed. Moonwalk Sunbrook Pleasant little trail from Main Summit that bisects Cloud Nine and terminates at Little Dipper. Easily negotiated by strong novices. Generally groomed. Narrow Gage Carinthia Runs the liftline of the Heavy Metal double chair. An old Carinthia-era trail, narrow, no snowmaking, seldom groomed, a real test for most intermediates. Now listed as a “Natural Snowfall Park” in that Mount Snow will build features as conditions permit. Nitro Carinthia Runs the length of the Nitro Express chair, also accessed from Prospector. Slated for small & medium park features in 2008. Called Lower Mainstreet on Mount Snow’s 1986 trail map. Nugget Carinthia Short, mild trail that leads from the top of the Nitro Express chair down to Long John on the Main Face. Groomed regularly. Olympic North Face One of the few North Face trails that hasn’t been renamed or realigned for over 35 years. Top half has some pitch, bottom is Formerly an intermediate rated trail. Natural snow only. Not generally groomed. One More Time Main Face Long, turning trail off the Canyon Express chair; on the extreme right hand side of the Main Face (last trail on skier’s left before North Face). Moldy oldie dates from at least 1970. Natural snow trail suffers from thin cover in light snow years; not usually groomed. One Small Step Sunbrook Short easy trail that connects Big & Little Dippers to Thanks Walt. Generally groomed. Overbrook Main Face Enjoyable, narrower version of neighboring Snowdance. Accessed from the Canyon Express chair. Originally known as Lower Overbrook; Upper Overbrook no longer exists although part of it is now Second Thoughts. Narrow and not groomed frequently, it is often a bit tough for most intermediates. Pat’s Pitch Main Face Very short section of the Summit Local liftline, from Somerset Road down to Low Traverse. Trail has existed for decades, name seems to be more recent. Rarely groomed, seldom open. PDF North Face Another of the few North Face trails that hasn’t been renamed or realigned for over 35 years. Steep, not generally groomed. The Pit Carinthia This is a flat, “play in the snow” area in front of the Carinthia Lodge, no lift service, nor is one required. Officially named to coincide with the 2008-09 parkification of Carinthia. We’ll probably see a few small features and oddments here. Plummet North Face Dates back to 1958. Steep trail between Jaws and PDF. Originally part of this route was the upper section of Jaws of Death, now continues as its own trail. The original Plummet is now part of Jaws of Death. Sometimes groomed, as the photo at right shows. Prospector Carinthia Trail connects Long John on the Main Face to Nitro, Titanium, and Iron Run, and then becomes a true Carinthia trail, where it collects traffic from Mine Shaft and Claim Jumper. A natural park trail; features are built when snowfall permits. Part of the Iron Run trail back in the Carinthia days,then re-named Ryan’s Run after Mount Snow took over. Ridge Main Face Runs from top of Sundance chair, although you do have to follow the flat section of Long John briefly to reach it. Terminates at the base of the Sundance chair. Older trail has followed similar route for decades, although the original name was Ridge Run; the “Run” portion was dropped sometime after 1982. A very popular blue cruiser, big and wide, usually groomed. Has a couple of drops here and there, a little tougher than Snowdance but has a similar feel to it, although with less traffic. Considering the trail is so big and so little traveled, it is pure pleasure for a good intermediate. Overall one of the best trails on the mountain. Ripcord North Face Mount Snow’s signature expert trail, a 40�+ bump run, mercifully short compared to other North Face trails. Original trail, Slalom Glade, ran a gentler route. Not groomed. Rerouted and renamed Ripcord sometime between 1982 – 1986. For experts only; the photo here does not do it justice. River Run North Face Connects Canyon Express chair traffic to base of North Face, also serves as run-out for Ripcord, Jaws, etc. Groomed regularly. Don’t underestimate River Run; it’s a pleasurable, twisting, old-time New England style run through the woods. Because it can be negotiated by a high end novice, it’s a great way to give developing skiers a look at the North Face — and particularly an eye-popping view of Ripcord. I recommend strong novices and higher take River Run just to see Ripcord and the North Face, then ride the chair to the summit and enjoy the view. It’s then easy to find Deer Run or Long John off the summit. Roller Coaster Main Face Trail off the Canyon Express chair that runs from Upper Canyon to Grand Central. Frequently used to access Standard from the chair. The lower section became a terrain park called Un Blanco Gulch in 1992, entire trail reverted to Canyon in November, 2008; re-re-named Rollercoaster for 2009-10. Was known as Riese’s Run for the 2003-2004 Season as the result of a “name a trail” charity auction. Can pretty much be negotiated by a very strong novice. Generally always groomed. Rusty Nail Carinthia New Terrain Park on an original Carinthia trail that leads from the top of the Heavy Metal chair down to a junction with Fairway. Easy slope, but not groomed as often as most greens at Mount Snow, and now populated with mid-sized terrain features. Known as Cold Brook Trail back in the Carinthia days, re-named Handle Road after Mount Snow took over, which in turn was re-named Rusty Nail, then briefly became Au Naturel, the thought being that it would be something of a “natural” terrain park. That’s pretty much where it’s at today, but it’s back to the Rusty Nail name. Sapbucket Main Face Short route, 1900′ long, partly under the Summit Local. Follows the liftline of the old Sapbucket chairlift; became an official trail after the chair was removed. Not usually groomed. Season’s Pass Main Face Connects very end of Deer Run with Carinthia. Branches off of Cooper’s Junction, crosses Sweet 16, then drops down as a pleasurable woods trail to Carinthia, where it branches off skier’s left into the Seasons Condominiums area. It then joins Tin Lizzy, runs through a tunnel, then traverses back to Cooper’s. Relatively new; not constructed until after Carinthia was absorbed by Mount Snow. Usually always groomed. Second Thoughts North Face Safety valve about a third of the way down Ripcord, this is a short traverse that has saved countless injuries over the past decade. A relatively new trail in relation to the rest of the North Face. Narrow, seldom groomed but not at all difficult. Shooting Star Sunbrook Narrow, fun route connects Long John to Thanks Walt, collects traffic from Cloud Nine on the way. Varying pitches, a true intermediate trail only at the entry point. It isn’t as steep as it first appears; it only looks that way because of how it drops off Long John. Usually groomed; it can be crowded on weekends or holidays when Long John becomes a bowling alley and skiers seek an escape. Shootout Main Face Runs the liftline of the upper section of the Sundance chair. Trail was called Lift Line 7 in the 1970s and 80s, followed identical route. Sometimes groomed, sometimes not. Has a bit of a double fall line here and there. Short Fuse Main Face Extremely short drop near the top of the #8 Tumbleweed chair, only recently added to trail maps. Hard to figure out exactly what Mount Snow is referring to; confusing relationship to Gunsmoke. It may be that this is small cut segment of the old #7 liftline dating back to the 1970s, or safety valve for tree skiing section called Frontier. Whatever it is, it’s not usually groomed according to the daily reports. Ski Baba Carinthia See Grommet, above. This slope was called Rope Tow when it was part of the original Carinthia ski area. Skyline Summit Short traverse connecting Summit, Sunbrook, and North Face. Really a novice trail, but rated intermediate because it leads only to intermediate or higher. Known as Sky Line through the late 1970s. Groomed regularly. Snowdance Main Face Long, wide trail off the Canyon Express chair; one of the signature groomed cruisers at Mount Snow. By mid-season, with full snow coverage, Snowdance is 100 yards wide, and probably the foundation trail for Mount Snow’s reputation for pleasurable skiing. Rolling terrain, can be handled by a high-end novice. Snowdance has followed the same route for decades. Usually always groomed, however, they tend to leave about a third of the trail on skier’s right ungroomed. Somerset Road Main Face Oldest, longest, most annoying traverse on Mount Snow. Runs clear across the main face from One More Time to Deer Run, and bisects everything in the process. Not a trail people seek out to ski; just used to move between trails. Annoying traffic crossings result. Officially named and completed sometime during the 1970s. Usually always groomed. South Bowl Main Face The premier upper mountain route from the Summit to the Sundance area. Receives a lot of its traffic from the Sundance chair via High Traverse. A popular cruising area, can generally be negotiated by emerging intermediates. Usually groomed. Sundance Main Face Popular trail that is located along the liftline of the Sundance chair. Historically speaking, there has been a “Sundance” trail at Mount Snow for decades: Upper Sundance was on the adjacent trail now known as Meadow, and Lower Sundance was on the trail now known as Cooper’s Junction. The Sundance you ski today was the lower segment of the Lift Line 7 trail in the 1970s and 1980s. Usually groomed. Sunspot Sunbrook Short chute connects Long John to Thanks Walt. Looks steep to the novices on Long John. Generally groomed. Sweet 16 Main Face Novice trail in the Sundance/Cooper’s Junction area, can be confusing as the entry is sometimes tough to pick out from the end of Deer Run, and unwary skiers can inadvertently wind up at Carinthia base. Narrow by comparison to Cooper’s, and usually has a couple of people plowing their way from side to side. Technically starts at Switchback, bisects Deer Run, then Seasons Pass, then turns back into Cooper’s. Groomed regularly. Once you know it, it’s a fun trail. Switchback Main Face Traverse that connects end of Long John with end of Meadow, crosses Deer Run. Used to avoid the logjam where Deer Run ends. The original Switchback was a true “switchback” used to skip a semi-steep grade on Sundance, just below what is now the top of the Tumbleweed chair. The original trail known as Switchback followed a route that is now the upper portion of Sweet 16 and the very end of Deer Run. Today’s Switchback is in the same vicinity. It is sometimes groomed, but it really doesn’t need to be. Thanks Walt Sunbrook Wonderful Sunbrook cruiser named in honor of the founder. Runs from main Summit area to Sunbrook base; part of it follows the original Coldbrook trail (not to be confused with the old Cold Brook at Carinthia) built in 1970. Generally groomed. Wonderful trail, but on days when this is the only Sunbrook trail open, it can get real icy real fast. Tin Lizzy Carinthia Short slope that connects The Flats with Season Pass. Exists mainly to provide Fairway & Rusty Nail traffic a route to the Sundance and Main Base Lodges, and for condo bound traffic. Generally groomed. Tram Line Main Face Very short drop that connects Upper Exhibition with the Sundance-bound section of Link; also used to connect to Ego Alley. An old trail, not named on early maps. Not usually groomed. Uncle’s Main Face Considered part of the Sundance section; one of the three intermediate trails that drops off the upper flat portion of Deer Run. Terminates at Low Traverse and dumps into Meadow. Has followed the same route for decades. Narrower than most of the trails in Sundance, and not always groomed, can be one of the tougher blues at Mount Snow even though it isn’t very steep. Yard Sale Main Face One of the very few black diamonds on the Main Face, this is but a very brief headwall on skier’s right at the end of Ego Alley. Best accessed using Drop, can really be negotiated by a high-end intermediate. Originally this was part of Drop; it was the “drop.” Almost never groomed. Note that Mount Snow no longer maintains these sections. Although they are open, you go into these areas entirely at your own risk. They are full of hazards and are not patrolled. These names are listed for historical purposes only; SkiBum.net does not endorse nor guarantee that these are still skiable in any fashion. The Boonies Main Face Small tree skiing section served by Canyon Express, skier’s left off the One More Time trail. Good intro to tree skiing at Mount Snow; an unofficial area for many years. Claim Jumper Carinthia Tree skiing area off the Nitro Express chair. Varying pitches, some jumps, some steeps. Darkside Sunbrook Sunbrook’s tree skiing area. Like most of Mount Snow’s tree skiing areas, the trees are very tight here. Full name was Darkside of the Moon. Epiphany North Face Tree skiing section between PDF and Freefall. An unofficial area for many years. Fantasticks Main Face Tree skiing section in the Sundance area, accessed from Ridge. Frontier Main Face Lower mountain tree skiing section, rather small, located skier’s right (looker’s left) off the Tumbleweed chair (go left off the chair and turn left), not a good place for a tree skiing area. Smallish, too many trees, pointless. But it’s very popular, so what do I know. The Plunge North Face Tree skiing alternative to Ripcord, skier’s right off that trail. Nasty. Sap Tapper Main Face Mid mountain tree skiing section skier’s right off Ego Alley. Most just venture in a little, then wisely venture back out. Not used much. The Trials North Face Lengthy tree skiing section north of Olympic. An unofficial area for many years. Coldbrook Sunbrook Now part of Little Dipper and the lower portion of Thanks Walt; trail can no longer be skied straight through as it once was. Grommet (original) Main Base This was an introductory terrain park for beginners located on the Beaver slope. Jiblet Main Base See Mixing Bowl, below. Jiblet was a name used briefly for this area in the late 2000s. Liftline #3 Main Face 1980s summit trail re-named Upper Choke and now simply the top part of Choke. Not shown as a trail on brochures dating from the 1970s. Meadow Main Face Began where Link widens at the end of Hop, loops around as a wide, gently sloping meadow, easily negotiated by all but the greenest novice. Originally this trail was known as Upper Sundance, built in 1960. Today it is the end of Link (after Hop) and what is now the continuation of Ridge. Ridge used to end where it meets Link (then known as Meadow). Mixing Bowl Main Base Mixing Bowl was an interesting slope adjacent to the Covered Bridge surface lift. This used to be a great training area, but when I used this trail in early 2006 I was told by the Covered Bridge liftie that it was NOT for routine skiing — the trail was only to be used for returning to your car, and the lift was for the tubing operation. Section was briefly reopened as Jiblet, but has since turned into a tubing-only area. Years ago, Mixing Bowl had its own 700′ double chair. Moonwalk Sunbrook renamed Big Dipper. Powerline Main Face very short trail that connected Deer Run to South Bowl, still in use today as the uppermost part of High Traverse. Pyrite Carinthia Short, mild trail that leads from the top of the Heavy Metal chair down to a junction with Deer Run, at the end of Long John on the Main Face. Still exists, but not named on the trail maps as it’s hardly a trail. Slalom Glade North Face Rerouted and renamed Ripcord sometime between 1982 – 1986. Standard Main Face Trail now called Canyon was known as Standard for about 55 years. Stugger’s Chute Carinthia Old name for Inferno in the Carinthia section. Titanium Carinthia Now called “Fool’s Gold,” listed as a “Natural Snowfall Park” in that Mount Snow will build features as conditions permit. Trail originally called Upper Titanium and Titanium during the 1990s, was Upper and Lower Villager in 1986. Tunnel Vision Carinthia Brief name for traverse linking Titanium to bottom of Mine Shaft, used to access lower segment of Claim Jumper. It fell off the Carinthia map in ’08-’09. Upper Iron Run Carinthia Another ASC name creation to increase trail count, the section of Iron Run from the Prospector trail to the Caved In traverse. Upper Nitro Carinthia ASC name-game section of Nitro that went along the upper liftline of the Nitro Express chair. Trail was called Upper Mainstreet on Mount Snow’s 1986 map. Upper Titanium Carinthia ASC used this name for the upper portion of — you guessed it — Titanium, mainly to increase trail count. Now the entire trail is known as Titanium. Trail was called Upper Villager on Mount Snow’s 1986 map. Wanderer Summit n/a shown on various trail maps through the years, this was an official cross country trail that went south along the ridgeline from the summit. It still exists today, but is really only used by backcountry enthusiasts. In the mid 1940s, Schoenknecht developed Mohawk Mountain Ski Resort near Torrington, CT. He began development of a new ski resort on Mount Pisgah, in West Dover VT, when he purchased the land from a farmer named Snow. The name was a natural for his new ski area, since it sounds like the mountain has lots of snow. It also made a nice tribute to the family. Schoeknecht had snow on his mind during this time. During the weak winter of 1950 he was at his wit’s end to draw skiers to the bare slopes of Mohawk Mountain. Rather than continue waiting on Mother Nature, Schoenknecht procured 500 tons of ice. He put it through an ice crusher, and spread the chips on the ski trails. Later that same winter, three Connecticut engineers sought to improve on the ice chipper technique, and developed a snow-making machine with a paint spray gun, a 10-horsepower compressor and some garden hose. Schoenknecht may not have invented the snow gun, but he certainly provided the impetus. As far as skiing was concerned, Schoenknecht knew that the success of Mount Snow depended on making it a destination resort. He built a luxury hotel, quirky restaurants, a heated outdoor pool, state-of-the-art lifts — a lot of them — and more. He devised a 300′ geyser that engineers found difficult to duplicate a half century later. Schoenknecht promoted slopeside barbecues, concerts, and whatever he could think of. When America entered the space age, he added lift cars that seemed to be flown in by George Jetson. …in 2007. Peak installed a bazillion dollars worth of fan guns, improved the infrastructure, redid the restrooms, facelifted the lodge, and painted everything that didn’t move. Heck, they even painted some of the stuff that does move. Result thus far is terrific. There’s a positive vibe, a lot of terrain opened early thanks to an aggressive snowmaking plan, and crowds of people back at ol’ farmer Snow’s hill. 1960s view of Mount Snow, prior to development of the Sunbrook area. The original Carinthia Ski Area is shown at lower left. For more old-timey photos and memorabilia, please click here for our vintage Mount Snow Memorabilia page. Haystack was purchased and added to Mount Snow in 1994, and sold off during 2005. At this point it is unclear when and how Haystack Ski Area will operate. It is said to be planned as an upscale, members-only operation — with the exception that local residents will have access. It is rumoured in skiing circles that the original, lower novice area (shown in the foreground in this photo) will be developed for other uses. Update: The planned upscale resort is currently stalled.